We could not be in business 29 years without making our clients the most important part of any transaction. The relationship you have with your REALTOR is the insurance that your needs and interests will be represented properly. Many agents are available to research data or drive you to homes. Our past CLIENTS SEND THEIR FRIENDS to us because we have been honest with them, have worked hard to achieve their goals and have 29 years of knowledge to give them the edge in the competitive market whether they are a buyer or seller. Hundreds of properties have been sold by Chandler Properties. We will not take part in a transaction that is not ethical and professional. We are happy to provide referrals to clients that have experienced the extra mile that we go for them. Click on TESTIMONIALS to read some of their remarks. I have access to a wide array of loan programs that meet the needs of almost any borrower, even poor credit, short time on job, etc. Comparing loan programs carefully not only SAVES UP FRONT FINANCING COSTS but may impact a Real Estate investment for the life of that loan. Many clients prefer the convenience of having the loan and real estate transaction handled by the same broker and know they WILL NOT BE OVERCHARGED. Anita has been residing in Orange County and particularly in Huntington Beach/Fountain Valley area for 38 years. Because she grew up in a family that invested in Real Estate she has absorbed much helpful information. Her background includes rehabilitation and renovation of property including government owned. After this background it was natural her interests evolved to marketing Real Estate in 1977. Within a few years she studied for her Brokers license and opened her own office. She is a notary who will offer complimentary notary service. 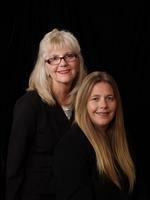 In 2000 her daughter, Carol joined her making it the 3rd generation to make a career in Real Estate. Their teamwork serves to offer more to their clients because they can always be available. Anita and Carol participate in many service projects for the underpriviledged including elderly and children, adopting kids at Christmas who wouldn't otherwise have a special memory. We give part of our commissions to worthy projects because we appreciate our fortunate lives.